Jamestown, VA…A team of scientists from the Smithsonian’s National Museum of Natural History and The Jamestown Rediscovery Foundation at Historic Jamestowne announced the identities of four men buried within Jamestown’s historic 1608 church, the location of Pocahontas’ marriage to John Rolfe. These people, Rev. Robert Hunt, Capt. Gabriel Archer, Sir Ferdinando Wainman and Capt. William West, were high-status leaders who helped shape the future of America during the initial phase of the Jamestown colony. After being lost to history for more than 400 years, their discovery reveals new clues about life, death and the importance of religion in one of England’s most critical settlements. It also illustrates how modern tools can be applied to historic investigations to aid in personal identification. To determine the men’s identities from the unearthed bones, Smithsonian forensic anthropologist Douglas Owsley and his team worked with archaeologists from Jamestown Rediscovery. They used multiple lines of evidence, including archaeology, skeletal analyses, chemical testing, 3-D technology and genealogical research, to single out the names of the four men from dozens of English colonists who died at Jamestown from 1608 through 1617, when the church fell into disrepair. The men lived and died at a turning point in the history of the settlement—when it was on the brink of failure due to famine, disease and conflict. 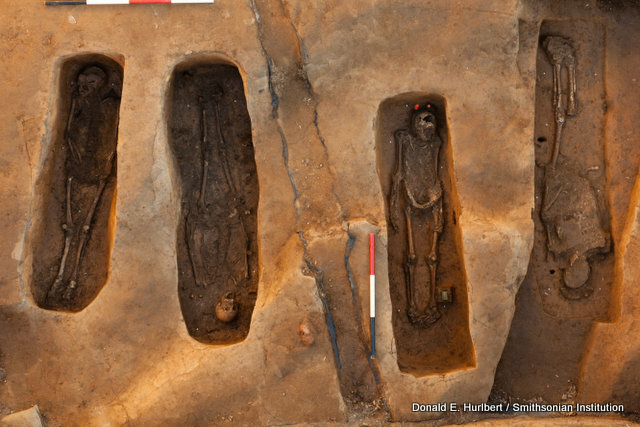 The skeletons and archaeological materials were found beneath the chancel area of Jamestown’s 1608 church at the front of the structure where a communion table would have been located and where only elite members of the community would have been buried. Rev. Robert Hunt was born in 1569 and died in 1608 around the age of 39. He was the first Anglican minister at Jamestown and served the colony until his death. The research team identified him by his age and style of burial: he was buried in a simple shroud with no coffin facing the people he served, his congregation. Capt. Gabriel Archer was born in 1575 and died in late 1609 or early 1610 at the age of 34 during the “starving time,” a six-month period during which approximately 250 settlers perished at Jamestown from disease, starvation and Indian attacks. His journal entries indicate that he helped lead some of the earliest expeditions in the Jamestown colony and was a nemesis of Capt. John Smith. Archer’s remains were suspected when archaeologists discovered remnants of a coffin and captain’s leading staff with the bones. The team also found a small, well-preserved silver box resting on top of Archer’s coffin. Extensive high-resolution CT scans of the sealed box revealed that it is likely a Catholic reliquary encapsulating seven fragments of bone and two pieces of a lead ampulla, a container used to hold holy water. Religion played a prominent role at Jamestown, and many efforts were made to convert the neighboring Powhatan tribes to the Anglican Church. The presence of the reliquary, however, suggests that at least one of the colonists retained his Catholic faith, perhaps in secret. Sir Ferdinando Wainman (sometimes spelled “Weyman” in historic documents) was born in 1576 and died in 1610 at about age 34 after arriving at Jamestown with his first cousin and governor of Virginia, Sir Thomas West, also known as Lord De La Warr. Genealogical records indicate that Wainman was the first English knight buried in America. Chemical testing of his bones showed he was exposed to more lead in his life than the other three men, suggesting affluence. Lead was present in pewter and glazed wares, items more accessible to the wealthy. The research team also studied the unusual pattern of coffin nails from the grave and determined that Wainman was buried in a uniquely styled anthropomorphic, or human-shaped, wooden coffin. Capt. William West was born in 1585 and killed in 1610 around the age of 24 during a skirmish with the Powhatan. He was the young uncle of Lord De La Warr and like his relative, Wainman, had high lead levels in his bone. Coffin nails in his grave indicate he, too, was buried in an anthropomorphic coffin. West’s high status at Jamestown was affirmed when the research team used a micro-CT scan to reveal highly decayed remnants of a military leader’s sash in a block of surrounding soil. The cloth is likely silk and is adorned with silver bullion fringe and spangles. The examination of the skeletal remains and artifacts comes at a critical time in Jamestown’s history, as preservation of these materials is threatened by ongoing changes in the soil and water levels at the site. Jamestown is susceptible to sea-level rise, which some scientists predict could submerge the island by the end of the century. Smithsonian anthropologist Owsley and his team have worked closely with Jamestown Rediscovery archaeologists since 1996, examining skeletal remains in an effort to better understand the lives of the first colonists in the Chesapeake. Continued study of the skeletons will involve genetic testing to better understand the familial relationship between Wainman and West. Further historical and archaeological work is also underway to discover additional information about the four men’s experiences before arriving in Virginia, the significance and sacred meaning of the silver box and the importance of religion in early Jamestown. The Smithsonian’s 3D Digitization Program Office, in collaboration with Jamestown Rediscovery, conducted detailed scans of the burial sites and has archived the digital data, which is available at 3d.si.edu. There, anyone can download or interact with 3-D models of the chancel burial ground, the four graves and Archer’s silver box; look at a collection of high-resolution field photos and videos; or take interactive 3-D tours of the site. 3-D technology is playing an increasingly important role in archaeology and forensic anthropology. An accurate and measurable record of these burials as they lay in the ground not only preserves critical information for research, but also tells the story of North American history in a way never before possible. This discovery was made possible thanks to several important partners. Ancestry.com provided genealogical research support. GE and Cornell University provided access to CT scanning facilities, and Micro Photonics Inc. scanned and modeled the contents of the silver box. Autodesk Inc. processed the 3-D scan data of the excavation.